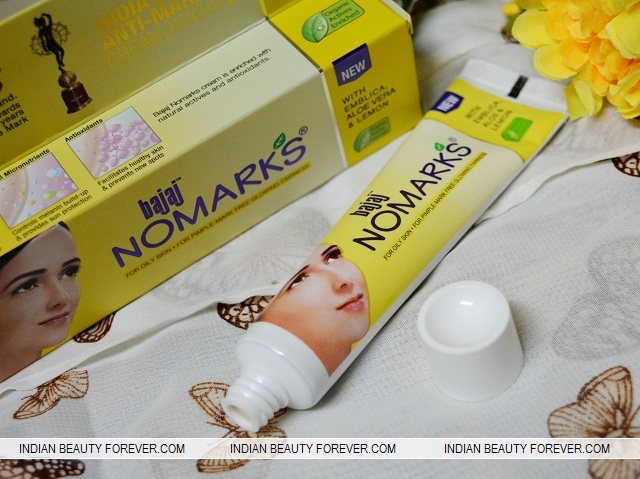 I will review Bajaj No marks cream for oily skin for pimple marks and glowing fairness. This cream is formulated for the oily skin that gets greasy pretty quickly and pimple marks is the main beauty concern. I have already reviewed Bajaj neem face wash and their scrub which were really good and inexpensive. Price of Bajaj No marks cream for oily skin: This cream is priced at 85 rupees for 25 g and smaller pack is also available. 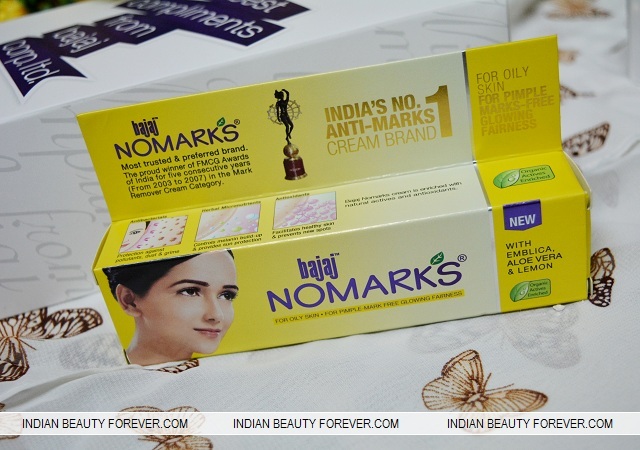 Claims: New Bajaj No Marks Cream for Oily Skin and Pimple-Mark Free Glowing Fairness is enriched with Organic Actives Enriched ingredients like Emblica, Aloe Vera and Lemon that penetrate the deeper layers of your skin and prevent marks and occurrence of pimples. The cream comes in a decent tube which is a good packaging for creams like that and most importantly hygienic to use. The cream comes in a yellow tube with a yellow outer carton that bears all the information as you can see. The cream is a pale yellowish colored cream with a rather smooth texture. It emits a lemon kind of fragrance which is good. It gets absorbed in the skin real quick and skin look matte not greasy, oily or sticky. I have used this cream long ago and since the product is almost finished I stopped using it and moved on to review the next product for you! So, till the time I have used I have noticed that the cream isn’t too heavy that would block the pores or anything. It has embilica which prevents the pimples and lemon which is good for oily skin along with aloe vera which soothe and refreshes the skin without making it sticky. It has helped lighten few blemishes that I had due to the pimples on my chin and while I used it, the feeling on my face wasn’t heavy. If you know what I mean. That tightness or mask like feeling that some cream can give. This cream wasn’t like that though the oil controlling feature isn’t there. The oils on my T zone starts to show up after 2-3 hours like usual. 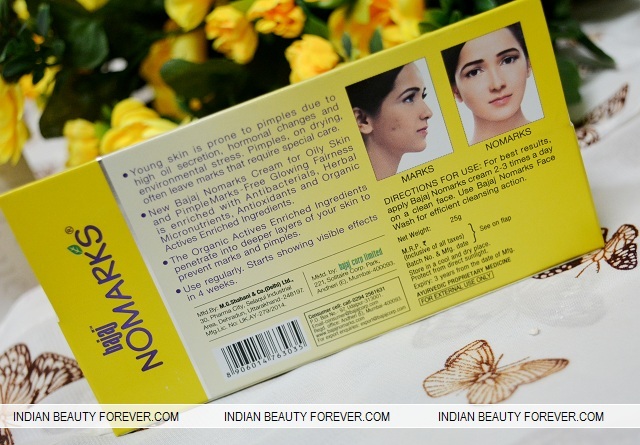 This New Bajaj No arks Cream for Oily Skin is a decent skim cream for oily to combination skin that is prone to acne. It fades the pimple marks and keeps the skin matte after the application though you will need compact to combat the shine on your face. For the price it is a good to try product. Boys too can try this. Seems like a decent product. I need something like this for my pimple marks !